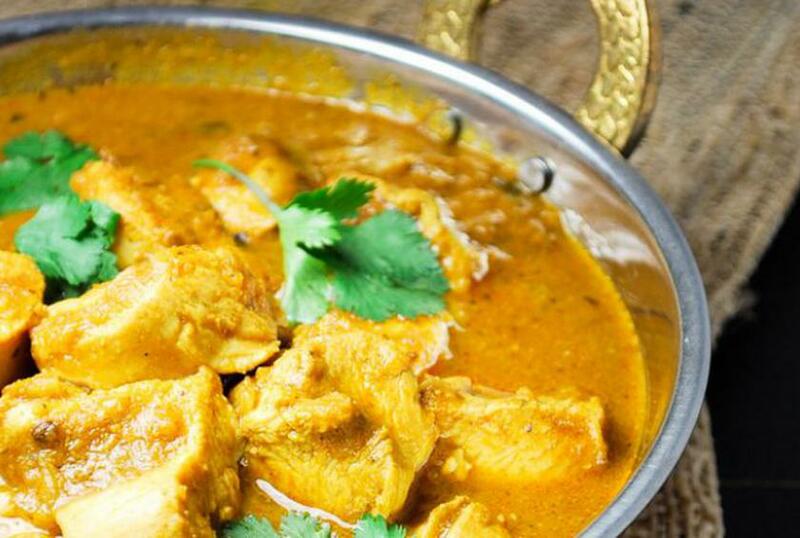 Authentic home-style Indian chicken curry is the Indian recipe people are most familiar with. It’s perfect with rice and naan, but you can always add veggies like potatoes, peas, and carrots to the dish if you’d like a one-pot meal. In a large pan, heat some oil. Once hot, add cumin seeds and red chiles. Once it becomes fragrant, add the onions. Cook until golden brown and then add the turmeric and ginger garlic paste. Cook until the raw smell goes away. Add the tomatoes and green chiles, cover, and simmer until oil starts showing through tomatoes. Add to a blender and blend. Melt some butter in the same pan, and then add the tomato blend. Add a little chicken stock to thin it out (the rest of the spices will make it thicker). Add the rest of the ingredients except for the chicken, and simmer for 10 minutes. Add the chicken and simmer chicken for 20 minutes, or until chicken has cooked completely. Finish by stirring in garam masala powder. Powered by "Hindi World Of Recipes".